If you don't have the time for full diver training, but would like to experience the ease and thrill of diving, join us for our half or full day program. Our instructors will teach you basic theory and familiarize you with the equipment before accompanying you on a beautiful, controlled dive to limited depth. You have the option of diving either at a local coral reef, or in the clear waters off the island of Ko Racha. Thinking of getting certified for an upcoming vacation, but don't have the time to put into a regular diver course? Now there's a quick and easy program designed especially for you! The PADI Scuba Diver program is a pre-entry level certification that is perfect for vacationers or people who only plan to dive a couple times per year. As a subprogram of the PADI Open Water Diver program, the PADI Scuba Diver rating allows you to get certified quickly and easily by minimizing time constraints. With the PADI Scuba Diver certification you can dive under the direct supervision of a PADI professional on your next vacation or dive trip. During the course you will use the PADI Open Water Diver Manual and Video. Credit earned in this program can be used toward the Open Water Diver certification. The Open Water Diver course uses the same materials as the Scuba Diver course, so you will already be on your way to continuing further dive adventures. The Open Water Diver Course is for the beginner or non-certified diver and will give you all the required knowledge and skills necessary to make your diving safe and fun. 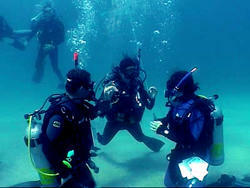 The course will take 3 or 4 days with some time spend in the classroom followed by pool dives and theory and practice. The course consists of five academic modules with Videos, four short quizzes, the final exam, five pool sessions and a 200 meter swim test and a 15 minutes survival float as well as a minimum of 4 open water dives. The course concludes with four open water training dives under the supervision of your instructor where you can apply the skills you just learned in the classroom and pool. With two days on the boat you will always get an extra 5th dive or in many cases even a 6th dive to gain more experience while allowing you to enjoy the tropical reefs of the Andaman Sea. All our boat dives are made from the MV Dive Asia II. After completion of the course, you will become certified as an internationally recognized PADI Open Water Diver. The PADI Open Water Diver Course knowledge development is now also available online via the PADI Elearning program allowing you to complete your training in 3 days here in Phuket.